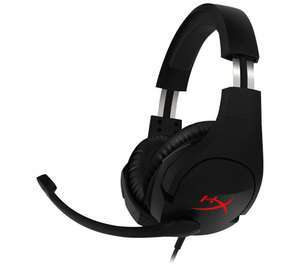 Currys/PC World have recently been doing some great deals on the Hyperx line of gaming headsets and have dropped the price of the Cloud Stinger to £24.99. I bought this for £5 more from Amazon thinking the last deal posted was a cracker. I bought this for £5 more from Amazon thinking the last deal posted was a …I bought this for £5 more from Amazon thinking the last deal posted was a cracker. What are these like?Any good? I have one and don't like it. The sound quality etc is fine, but the headset feels cheap to me. I use Discord to chat to friends whilst gaming on the PC and for some reason with this headset they can hear everything going on in my games, which never occurred with my last headset. My son has had a pair for about a year with fairly high utilisation and they are still working and in good condition. Fair sound for the price I think. Comfortable. He loves them and when I have used I have thought they were good. Hence buying another set when I saw what I thought was a bargain! Don't think you will regret for £25. I very nearly jumped on this for DS, until I realised that he has the Cloud II ones which are more expensive still. Look virtually identical to my untrained eye! These got a 3.5mm aux so I could use them with my phone for example? Amazon should price match these hopefully. Still on the fence though between these on the more expensive pair...the reviews are putting me off because of the mic quality. Amazon are now price matching these. Amazon should price match these hopefully. Still on the fence though …Amazon should price match these hopefully. Still on the fence though between these on the more expensive pair...the reviews are putting me off because of the mic quality. I keep seeing comments about amazon price matching and I don't get why. Why would anyone choose to use amazon over popping to currys and picking one up today? I keep seeing comments about amazon price matching and I don't get why. …I keep seeing comments about amazon price matching and I don't get why. Why would anyone choose to use amazon over popping to currys and picking one up today? Very simple. I don't have to waste money on petrol going to the store, don't have to waste time driving to the store, don't, have to waste time in the store with the rest of the great unwashed. Don't have to deal with the tragedy that is currys customer service. Amazon Prime is ace when you live in the sticks. My nearest Currys is a 2 hour round trip. Still on the fence though between these on the more expensive pair...the …Still on the fence though between these on the more expensive pair...the reviews are putting me off because of the mic quality. There is nothing wrong with the mic quality on these just a heads up. I've got two of these, great headset. Same price as black friday last year! Seems fine in my samsung s6. I have one and don't like it.The sound quality etc is fine, but the …I have one and don't like it.The sound quality etc is fine, but the headset feels cheap to me.I use Discord to chat to friends whilst gaming on the PC and for some reason with this headset they can hear everything going on in my games, which never occurred with my last headset. Think you have a faulty set, I get no probs in discord with my two, or in game. Think you have a faulty set, I get no probs in discord with my two, or in …Think you have a faulty set, I get no probs in discord with my two, or in game. Headset works in every other respect other than that. Can't imagine what would cause it, it it was a fault. Exact reason why I didn't bite when I seen them on the black Friday sale, mic for Xbox one X has to be at least good enough. Had an email saying my hyperx cloud alphas arrived today, grabbed Dolby Atmos licence last night knowing they were arriving today. £54. Will try out normal stereo first, then windows sonic and then finally Atmos, see what real differences there are. Not bad for a mid head set. I use them on the xbox. Can't do with a heavy headset so these are perfect. Got atmos on the xbox and the sound is good. No issues and with that price tag a steal. Deal posting newbie! This is mattb1705 first deal post. Help out by leaving a posting tip or just to show your appreciation for their contribution.